The Seiko 5 is a popular series, and this watch is another proud member. It has a black canvas band and a stainless steel bezel. The white numbers contrast nicely against the black dial. The watch looks sharp and is easy to read. Like others in the 5 series, it has an analog display with hour, minute and second hands. Also displays the date and the day of the week, too. It's self-winding and uses an automatic movement. No battery required - nice! It's water resistant to 30 meters, but that's a bit misleading. There's a good chance that if you go swimming with it on you'll be sorry! 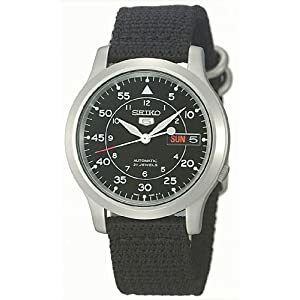 Other than that, it's a very nice watch and a good value for the price.